Last belated post for the theme: Greek myths. P.S. : No Minotaurs were harmed in making this shot. Very good! And look at the location. excellent - most glad of the PS. Wonderful - conception through to realisation all perfect! that animal doesn't look very happy. i meant the bull. aces, my good friends! aces! @overalvandaan thank you, Saxa! 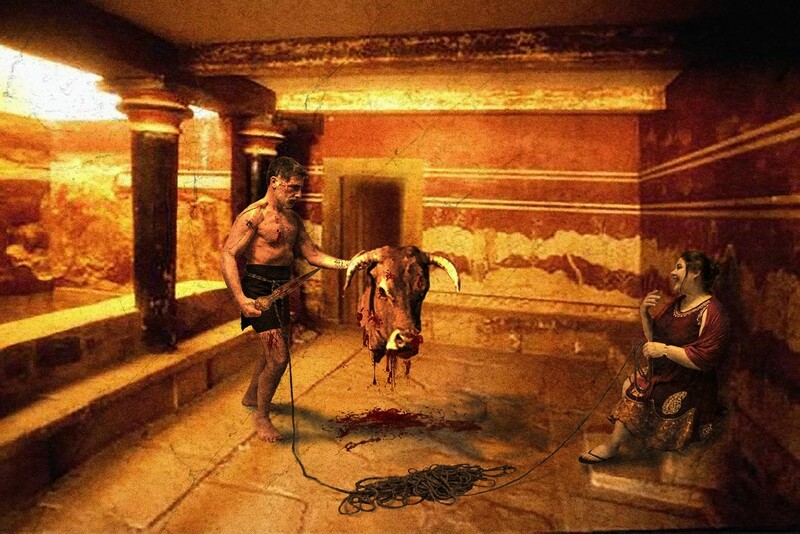 The place is the throne room in the Palace of Knossos, actually a photo of public domaiyn, not mine! @vignouse much appreciated, Richard, thank you! @kali66 thank you. Ties that build up across the oceans. @mikegifford thank you a lot, Mike! @summerfield oh sure, he asked for another part, namely in “The bull and Alcmena” or “Kidnapping Europa” but the director directed otherwise... thank you a lot, friend! Id just like to add that this backdrop showed up in my dreams last night and I was mighty impressed with how you had manipulated it to create your two scenes. @helenhall oh, this is fascinating, Helen! I think the Knossos Palace is one of the most striking places, also for its being the theater of such powerful myths (the Labyrinth, Daedalus and Icarus, the Minotaur, Theseus and Ariadne....). Glad of having interpreted it in the right way! Thank you! @domenicododaro oh Domenico, what a fantastic composite! You have done so incredibly well with the blending of all things - amazing photo! Relieved indeed - until the island of Naxos incident ;) Are you sure I can't fav this??! !